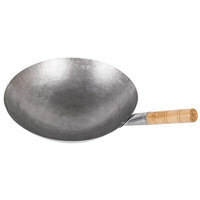 Saute Asian cuisine to perfection with this Town 34716 hand-hammered Cantonese wok. 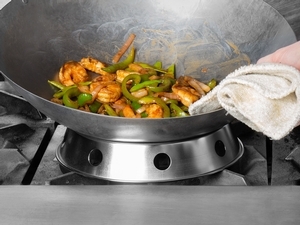 No other pan in your kitchen has the versatility of a good wok pan! 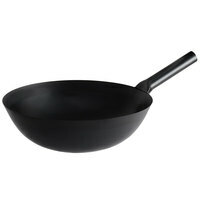 Woks aren’t just for Asian cuisine anymore; the design of the wok pan is perfect for cooking a variety of dishes. Unlike a traditional skillet, which cooks from the bottom of the pan only, the wok features high steep sides that cook foods from all sides. As food is tossed around the pan, it is cooked extremely quickly and thoroughly due to the even heat distribution. 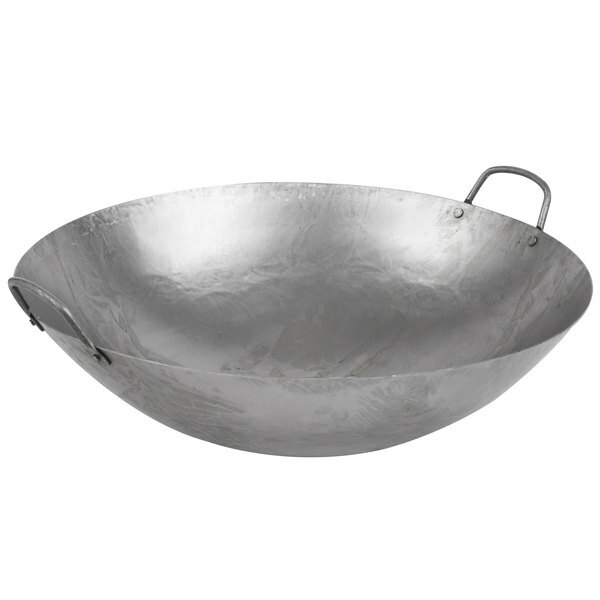 There is no substitute for a good wok when you need to saute and serve in large quantities, and this hand-hammered Cantonese wok is the perfect solution! "I was cautiously optimistic. Hand hammered carbon steel wok at this price? What's the catch? There isn't one. It has seasoned incredibly well, and the steel is thin enough to blast the heat directly to your foot and cool immediately once heat is removed. I love this wok." If you haven’t invested in a wok yet, you are missing out on a useful tool that allows you to stew, steam, boil, deep fry, and stir fry. 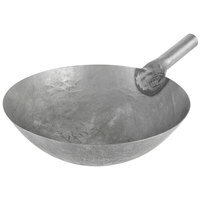 Cantonese woks like this one combine form and function in a cooking vessel that works great for both cooking and serving. Its hand-hammered design makes this wok just as attractive as it is functional, and it's great for serving large groups of people. Designed to be rugged and practically indestructible, this wok is made from 16 gauge cold-forged carbon steel, giving it the superior durability to stand up to hard use in a commercial kitchen. This material also provides, fast, even heating so that you can achieve predictable and consistent results. 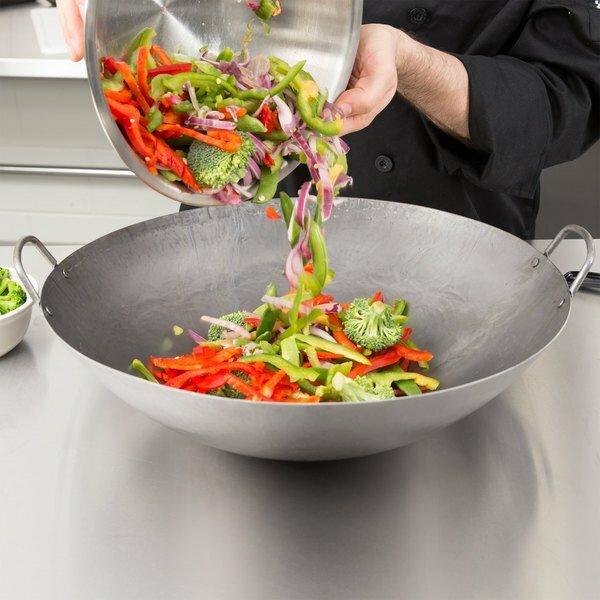 This wok is sized to fit a wok range with a 13" chamber, or it can be used with a wok ring (sold separately) on a conventional burner. The handles are riveted to the wok to provide excellent reinforcement and ensure that it will stand up to even heavy portions with ease. What is the difference between a Mandarin wok and a Cantonese wok? The difference is in the style of the handle. 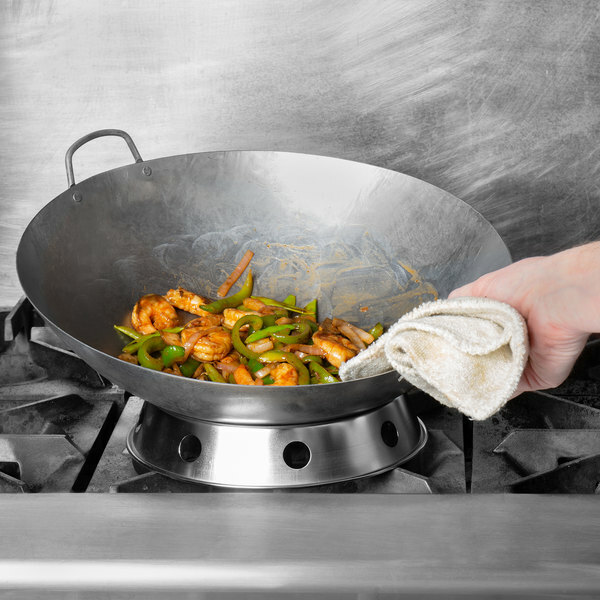 Mandarin woks feature a long stick handle, while Cantonese woks have two small loop handles, giving cooks a choice of whichever best fits their style. My item arrived coated with a thin layer of oil. What is this oil for, and is it ready for immediate use? 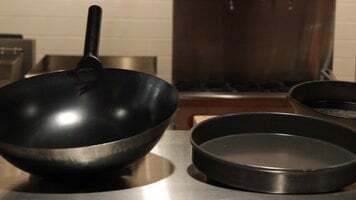 Some carbon steel pans and woks are shipped with a protective oil coating from the factory to prevent them from rusting before their first use. They must be thoroughly washed with warm soapy water to remove all traces of the oil, and then properly seasoned before use. What is the appropriate lid size for my wok? While lid size can be a preference based on what you're cooking, you generally want your lid to be approximately 1" - 2" smaller in diameter than your wok. 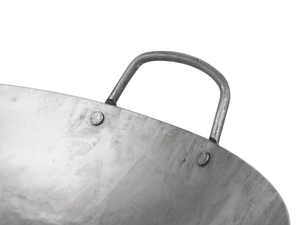 This is so the lid can securely sit inside the rounded edges of your wok. What is a wok ring used for, and how do I decide which is right for me? 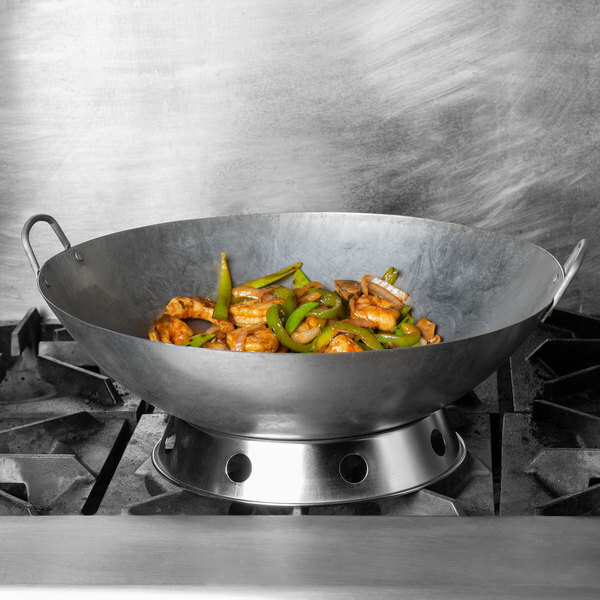 A wok ring is used to turn a traditional range into a wok-friendly range. 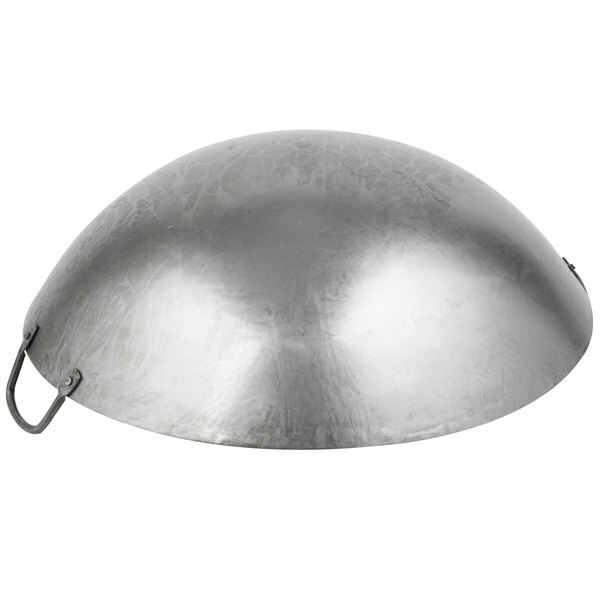 It serves to stabilize your wok and funnel the heat appropriately around the rounded edges as a wok range would. 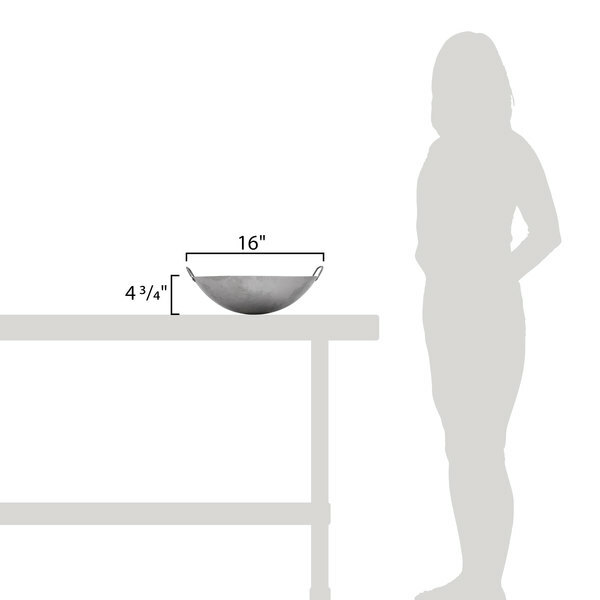 Generally, you want your wok ring's diameter to be 4" smaller than the wok you are using. For the price this is hard to beat. The factory grease was a little difficult to remove, some burned off during the seasoning process so have ventilation going. Has a great seasoning now and is one of my favorite pans to use. This is a beauty, it cooks great, I have had several woks over the years nothing has been as good as this one. The price is great and it is easy to season. 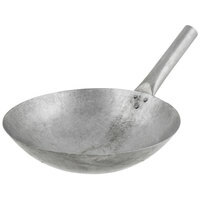 There is a shop that sells woks they are pricey for what you get, this is a steal. 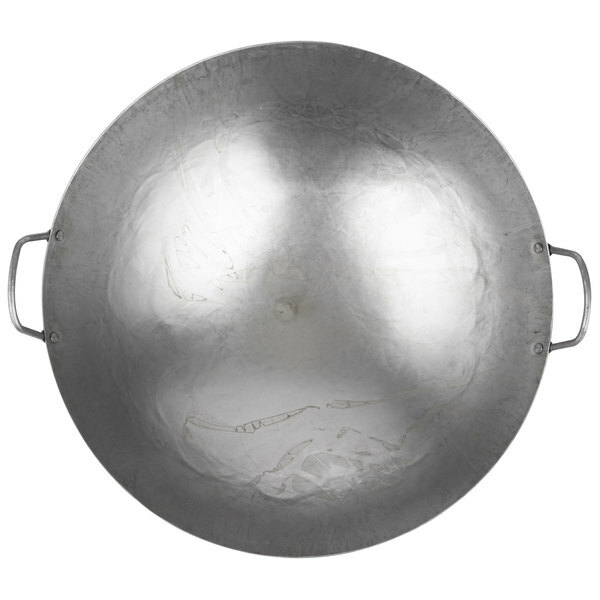 The Town 16” Hand Hammered Cantonese Wok is heavy weight and durable. The handles are well attached and easy to grip. It heats evenly and is easy to clean. This is a great Wok for the price! I was cautiously optimistic. Hand hammered carbon steel wok at this price? What's the catch? There isn't one. It has seasoned incredibly well, and the steel is thin enough to blast the heat directly to your foot and cool immediately once heat is removed. I love this wok. 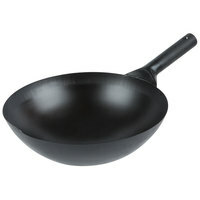 Decent carbon steel wok, good size for family stir fry or multiple portions at restaurant. Must be thoroughly washed (awful oil coating) and seasoned prior to use. Otherwise it will rust very quickly. 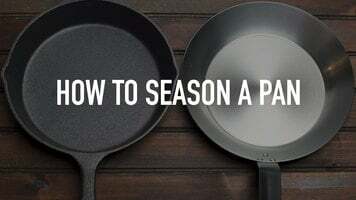 Rust can be removed and pan seasoned. Good bang for the buck, althogh rather thin. I am not satisfied with this product. low quality for a wok . Very hard to use. I wont be using this to cook ever again. Thank you for your review! We are sorry to hear that you are having issues with the wok you purchased. We suggest pairing it with a Wok Ring for the best results. I wondered what was the catch when I saw the low price.. haven't found it yet. Excellent bang for the buck, just give it a good clean before you use it. I've had a few other woks over the years, but this is my go to wok when making Chinese food. It's very durable, well priced, and heats evenly. This wok is amazing! The price was definitely unbeatable, and the quality surpasses my expectations. Very evident that it is hand hammered, which I like. Conducts heat as it should, and cooks beautifully. I would definitely recommend.